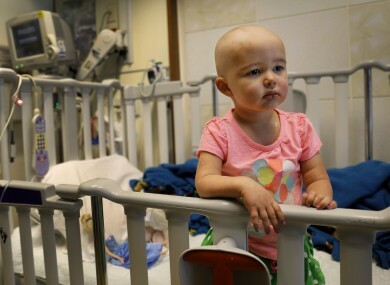 BARELY TWO YEARS old, Talia Pisano is getting tough treatment for kidney cancer that spread to her brain. She’s also getting a chance at having babies of her own someday. To battle infertility sometimes caused by cancer treatment, some children’s hospitals are trying a futuristic approach: removing and freezing immature ovary and testes tissue, with hopes of being able to put it back when patients reach adulthood and want to start families. No one knows yet if it will work. It has in adults — more than 30 babies have been born to women who had ovarian tissue removed in adulthood, frozen, and put back after treatment for cancer or other serious conditions. In lab animals, it’s worked with frozen and thawed testes tissue. But the procedures are still experimental in children who haven’t reached puberty, and too new to have been attempted. There are challenges to making immature eggs and sperm from removed tissue suitable for conception. Still, fertility researchers hope to refine the science while the first generation of children whose tissue has been put on ice grows up. Families like Talia’s are clinging to that optimism. The dark-eyed toddler who loves princesses and play dough had an ovary removed and frozen in April. She was treated for kidney cancer last year but when it spread, doctors started harsher treatment including brain radiation. “It seemed very new and pretty amazing that we can do something like this and help her in a bigger way,” said her mom, Maria Pisano, of Griffith, Indiana. “It definitely brought some peace” and raised hope for Talia’s future, Pisano said. Doctors face a delicate balance in broaching the idea of yet another medical procedure when families have been hit with a horrible diagnosis and difficult treatment plan. The tissue-removing surgeries are typically done while a child is being sedated for another reason. “We try to be thoughtful about the fact that their main focus and ours is on the survival of the child,” said Dr Erin Rowell, a surgeon at Chicago’s Lurie Children’s Hospital, where Talia is being treated. Yet, Rowell added, many families are open to hearing about saving their child’s fertility. That often is the one piece of information that gives them a glimmer of hope — that we believe that their children will live long enough to grow into adulthood and have their own family. A baby boy in Belgium makes scientists think they’re on the right track. He was born to a woman who at age 13 had ovarian tissue removed before undergoing harsh treatment for sickle cell anaemia. Doctors believe she had signs of puberty when the tissue was frozen, according to a recent medical journal report. Ten years later the tissue was thawed, and portions were grafted onto her remaining ovary. She gave birth last November after a normal pregnancy. She is the youngest person to date to have had success. Although her eggs were likely more mature than those of pre-puberty girls, the results are “super exciting,” said Dr Jill Ginsberg of Children’s Hospital of Philadelphia, a pioneer in the field. The irony of cancer treatment is that it can save lives while destroying the chance to create a new life. Chemotherapy works by killing rapidly dividing cells. These include malignant cells but also hair follicles, digestive tract cells, and sperm and eggs. Radiation can also damage these cells. Federal guidelines say there should be minimal risk to children involved in research, and risks need to be weighed against potential benefits, he said. “Kids themselves when they grow up would likely appreciate having that (fertility) option,” he said. After the tissue is removed, some is stored in liquid nitrogen for the patient’s future use and some is sent to a central research lab at Northwestern University in Chicago, where scientists are studying ways to make it work. Since 2008, the Philadelphia hospital has saved tissue for about 40 girls aged three and up and 50 boys — the youngest was three months. A few have since died but most still have tissue on ice, waiting for science and adulthood. Deaths from cancer are uncommon in children; about 80 percent survive, “so we have the odds in our favour,” Ginsberg said. His mom, Aileen Richert, says consenting to the procedure was tough. But then I was thinking, years from now, if my son gets married and wants to have children, what if I told him I’d had this option and I didn’t do it for him? When eight-year-old Hannah McStay of Mantua, New Jersey, was diagnosed with leukaemia, the offer of ovary-freezing forced her mum, Rachel, to have a very grown-up conversation with her. Email “Children with cancer are having their eggs and testes tissue frozen for the future”. Feedback on “Children with cancer are having their eggs and testes tissue frozen for the future”.